For the map and directions in pdf format for printing click here. For a link to the starting point in Google Maps click here. This walk starts in Georgetown and utilizes the Lovers Lane Walkway to reach Massachusetts Avenue and view some of the diplomatic residences in Washington, DC. It returns via a well-utilized paved trail through Rock Creek Park and a short walk through a portion of the Georgetown historic district. Since the Lovers Lane portion of this walk is isolated it is suggested that this walk may not be appropriate for singles. Only on-street parking is available and it is somewhat limited in this area. Lovers Lane serves as the entrance to Dumbarton Oaks Park from R Street NW. 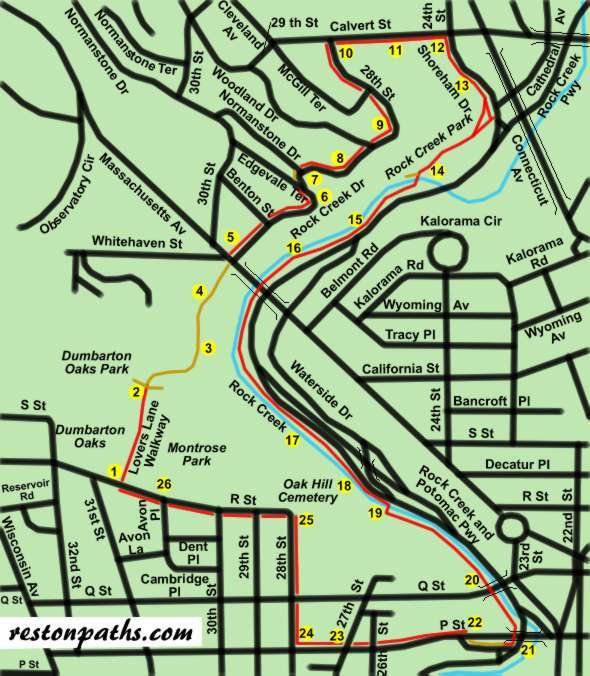 Look for the sign marked 'Dumbarton Oaks Park' on R Street just east of the Dumbarton Oaks mansion at 31st Street. The paved path goes down a steep hill with a wall on the left and Montrose Park on the right. There are intersecting paths to the left and right at the bottom of the hill and the pavement ends. Continue straight and follow the dirt path as it curves to the right and climbs a grade. The path to the left enters Dumbarton Oaks Park. The path to the right heads down towards Rock Creek. After the next turn to the left Rock Creek can be seen below when the leaves are off the trees. The building to the left as you near Massachusetts Avenue is the Italian embassy. Cross Massachusetts Avenue to Rock Creek Drive on the opposite side. There is a crosswalk to the left. Follow the sidewalk on the left side of Rock Creek Drive. Most of the buildings and homes in this area belong to diplomatic personnel. Continue along the sidewalk as the road turns sharply to the left. There is no sidewalk for the short section of road between Edgevale Terrace and Normanstone Drive. You will need to walk along the side of this lightly traveled road. Another sidewalk appears on the left after crossing Normanstone Drive. Continue on this sidewalk keeping the woods on your right. Rock Creek Drive makes a turn to the left. You will soon be crossing Woodland Drive. Rock Creek Drive ends at 28th Street. Turn left and take the sidewalk up the hill along that street. Turn right at Calvert Street and follow the sidewalk to the right along that street. The hotel on the right is the Omni Shoreham. Continue to the first street past that hotel. After going some distance down the hill turn right onto the first intersecting asphalt trail. The Taft Bridge in the distance carries Connecticut Avenue across the park. The Metro Red line crosses underneath Rock Creek on the other side of the bridge. The trail crosses Rock Creek on a bridge. Do not take the dirt trail to the right just prior to the bridge. The intersecting road on the left provides a connection to Massachusetts Avenue. Continue on the pedestrian trail along Rock Creek. The trail goes under Massachusetts Avenue. The buildings on the hill to the left are embassies along Massachusetts Avenue. Oak Hill Cemetery can soon be seen on the right across the creek. The trail turns right and crosses Rock Creek. It then turns left and continues to follow the creek. The trail goes under Q Street. This is the Dumbarton Bridge but is nicknamed the Buffalo Bridge after the 4 buffalo statues created by sculptor Alexander Proctor in 1914. Look up on the right after going under the bridge and you will see one of the buffaloes. The trail goes under the P Street bridge. On the other side the paved trail goes to the right along the entrance road for a short distance. At the point where the paved trail crosses the entrance road continue on the dirt trail on the right side of the entrance road and go up to the intersection with P Street. Turn left and go west on P Street. There are several convenience stores in this section of town. These are historic homes in this section. Georgetown was considered a slum until the 1930s when people suddenly realized it’s potential and started a massive restoration program making this a very exclusive area today. Turn right and follow 28th Street for 2 blocks to the end. Oak Hill Cemetery appears on the right. Turn left and follow the sidewalk along R Street. After passing the cemetery Montrose Park will appear on the right. The start of the walk is at the end of Montrose Park.